I do not write a gardening blog and I am no expert gardener. Although I don’t have a completely black thumb, I did in fact set a new record this year for the shortest time I ever kept a rosemary plant alive. The poor thing started dropping leaves within two days after I got it home, so I’ve been buying rosemary all summer. Fortunately, I do have an excellent gardening resource in my family: my mother. She is now a Certified Master Gardener, having just completed her program last spring at the tender age of 61! I’m so proud of her, and I call her all the time with questions about my garden. In spite of my amateur rank, I still enjoy trying to grow my own herbs and vegetables, and I’m a big lover of bulb plants. Every fall I assess my flower beds to see what needs to be divided or replanted. This year I’m starting fresh with a new flower garden, and I’ve been looking around at different places online and at local nurseries trying to decide what I would plant this year. My mother recommends White Flower Farm in Connecticut as an excellent source for bulbs as well as information on planting and growing many different kinds of flowers, so I’ve been studying their website. I stumbled across their Fall bulbs selection and nearly jumped out of my skin when I saw the saffron crocuses (which are completely sold out for 2007). For some reason I have always thought that I could not grow my own saffron flowers because they only grew in parts of Asia and the Mediterranean. Not so! I was so excited that I babbled what I wanted to do to Michael, and he was very supportive. (He’s such a great husband!) So I searched around until I found another vendor and I placed an order for 50 bulbs. That sounds like overkill, but I figure this is an experiment and I may lose half the plants in the process. So here is my plan. The bulbs (corms) will probably arrive next week. According to the instruction sheet I downloaded from White Flower Farm, I have to plant them right away, then they will go through a full year growing and dormant cycle before I can harvest the precious saffron in Fall 2008. I plan to document my experiment and post about it on this blog. This is a true experiment, particularly because Northern Virginia is in drought conditions and we’re no longer allowed to water our lawns or outside vegetation except with a 3-gallon container. I’m probably daft for even trying this, but if I wait until next year it will be Fall 2009 before I could harvest the saffron, so I figure it’s worth a shot now. If you too are growing your own saffron, I invite you to join in the experiment and share your experiences through the Comments for each post or on your own blog and share it with us. Andrea that’s a fantastic idea, and I’m getting my order for Northern Virginia saffron in now! Fun! The squirrels always get half my bulbs here, you might look to see if there’s something to keep them from digging them up. Inge: You are welcome to join in the experiment! I’m afraid I cannot guarantee that I’ll have anything next fall, but I’m going to try! Alanna: I’ve heard that a generous sprinkling of ground cayenne pepper over the bulbs and on the ground will keep squirrels and deer away. If you haven’t already planted them, talk to your mom about incorporating a product called WaterSorb, which is a completely non-toxic polymer & which serves to hold moisture in the soil. I’ve used it for years & it’s extended my gardening season as well as giving some drought tolerance to things. As for the squirrels – bulbs can grow around & through chicken wire, and it keeps the vermin from digging them out if they’re a couple inches under. Also, deer won’t brush up against rosemary, which is one reason so many vineyards in the Napa Valley plant it as a border. How interesting, Andrea…I had no idea that there was any hope of growing our own saffron crocuses! Of course, there probably isn’t any hope that I may be successful, but I will look forward to hearing about how your experiment progresses…that sounds really neat. 🙂 And also terrific that your Mom is a Master Gardener…you have a close at hand source of reliable planting knowledge for sure. Love those master gardeners! Have you been to Green Spring gardens? It’s fabulous and they have a MG program. This is a great experiment! 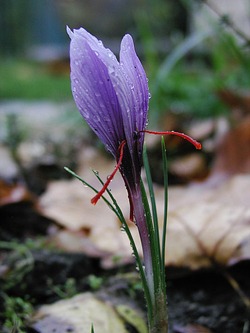 I actually was thinking about growing saffron the other day but it sounded too difficult for me. Congratulations to your mom!!! Wow, now Grow Your Own can have some expert advice, what do you think? I spread porous clay balls (about inch round or smaller), on top of vases, the clay gradually absorbs moisture and you don’t need to water much. That is the most delicious flower I’ve ever seen!!! Good luck!